That mask has such a powerful aura about it. It’s quite amazing. I’m instantly drawn to it but with a significant amount of trepidation. Whenever this mask design pops up you know something real is poppin’ behind the scenes. The hacktivist group Anonymous has taken up the use of the mask, and seem to be driven by proper motivations: exposing the absolute corruption of our government and the complete denigration of a country that used to run on a rule of law. I thought V for Vendetta was intriguing enough to justify the use of the Guy Fawlkes mask. But, even with all this rich rebellion, you have a commercial undertone. 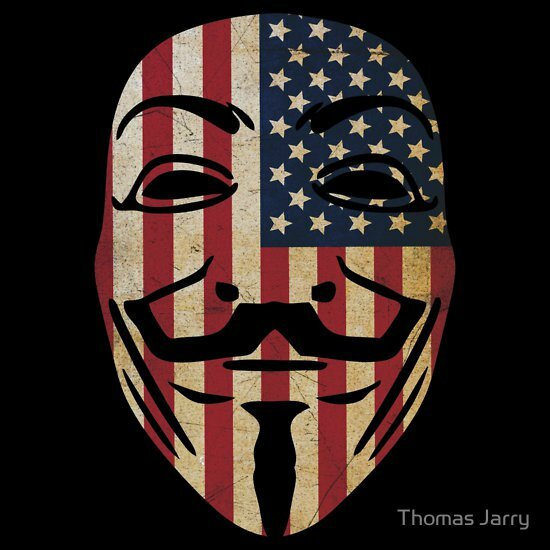 “Time Warner owns the rights to the image and is paid a licensing fee for the sale of each mask.” Maybe that’s why this mask design is imprinted with the US flag, but I prefer to think, it’s to call out the cradle of corruption, and move the spirit of the fight from the UK to the United States.